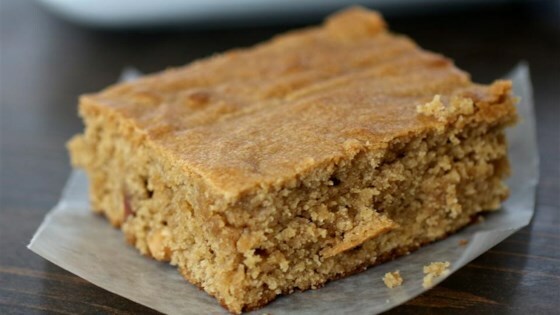 "Blondie brownies with crunchy peanut butter make a delicious treat. Enjoy with a cold glass of vanilla almond milk." Beat peanut butter and butter together in a bowl with an electric mixer until smooth. Gradually beat brown sugar into peanut butter mixture. Beat eggs into peanut butter mixture 1 at a time, beating well after each addition; add vanilla extract. Gradually sift flour into peanut butter mixture and mix until batter is well-combined. Pour batter into prepared baking dish and spread evenly in the dish. Bake in the preheated oven until a toothpick inserted into the center of the blondies comes out clean, about 35 minutes. Cool in the baking dish for 15 minutes before slicing into 24 bars. Remove to a wire rack to cool until just warm. The result had a perfect brownie texture (including the signature glazed topside), without being overly sweet. Worked well baked on a baking sheet 12'' x 18''. Super recipe as is! I made these as written and my family loved them. I am going to have to try to adapt the recipe to gluten free so I can try them.